I’m starting to feel better today. After three solid days of running a fever my fever finally broke last night and *knock on wood* hasn’t returned. I also broke down and went to the doctor yesterday, who blessedly gave me some antibiotics. He said he didn’t think it was pneumonia, however it’s possible it is that. The antibiotic he gave me, though, should help with bronchitis or pneumonia, but if I’m not much improved by tomorrow, I’m to go back for a chest xray. While I’m still pretty congested in my chest, my fever is gone, so I can actually function today, thank you JESUS. The last three days has been so hard. Being sick is hard enough, but taking care of Annabelle, worrying about getting her sick all the while, was not simple while dizzy and achy and feeling like I was going to pass out the whole time. She spent much time playing in her crib, as it was the one place I knew she was “safe” given her new mobile moves. I’ve also fed her NOTHING by mouth for three days, as it takes almost an hour and all of my energy on a GOOD day to do. So I’m afraid we’ve taken some steps backward there too. Anyway, enough of my complaining. Although, the below is a bit of complaining too! Funny, I wrote this Saturday afternoon before everything hit me, intending to post it this week. I’m thinking somehow, God knew I needed a bit of a break before all this came on. Some days… I just get tired. When I was in the hospital, these were the days I’d leave for a few hours. Go talk with my heart momma friends. Take a nap. Just… get away. Saturday, however, for no real reason in particular, I got tired of it all. I was trying to feed Annabelle after a questionable night sleep. I was tired, cranky, and Annabelle was having an especially bad “Eat? No way!” kind of morning. I’m a big believer in Mom’s knowing when they are nearing their limit so they don’t completely crack and do something they regret later. And as I sat there, spoon in hand, a screaming, cereal-covered baby in front of me, I had this incredible urge just to scream and throw the bowl of goo at the wall as hard as I could. I was at my limit. So… I quit. Quit feeding Annabelle. I took her out of her seat, pulled off her soaked bib and jammy shirt, and put her on the floor in the living room with her toys, naked except for her diaper and cast. Quit being a good momma to all my kids. They were in the living room and told them I was leaving and no, they could not come with because I needed time away from them, and to please just be quiet and leave me alone for a bit. I gave Annabelle her meds (I’m wasn’t THAT out of it,) got dressed, told my half-asleep, bewildered husband I was leaving, and left. The bookstore. I bought a book I’ve been wanting. Target. I bought a new pair of jeans and a shirt. All the jeans I have at the moment are so big on me (given my recent 18 pound weight-loss) and they literally almost fell down the other day while I was carrying Annabelle. I bought Annabelle new bibs (that will help because they are canvas, so I just rinse them off and they don’t bleed through to her clothes like her cloth ones, thus making us have to change clothes a minimum of 3 times a day.) I bought a few things for the kid’s Halloween costumes. Sonic. I got a big, not-on-my-diet cheeseburger, fries, and a coke. I enjoyed every single bite while I read my book in my car. Then I went back home. My sister had been there and threw a shirt on Annabelle (thanks, Jami.) Scott was awake by then and playing with Annabelle. The girls were upstairs, playing. No one was worse for wear from my moment of rebellion. Life went on. And I got about an hour and a half of quit time. But the little time I did take was enough to keep me going for a little while longer. How long? Well, that remains to be seen. I know this is something we don’t talk about a whole, whole lot. We feel guilty for “taking time” for ourselves. WE have to put our husband and kids before ourselves, it’s the nature of being a mother. But… sometimes, I’m thinking we need to take a time out and put ourselves first so we can be BETTER wives and Moms. Like everything in life, there is a balance. *sniff* I have no halloween pictures of her. I was just too sick to hardly move much less take a picture. I barely dressed her up, too, all she wore was her cute skirt. *sigh* None of my other kids got pictures either, although my sister-in-law got a few while they went out. She is doing well though. Still has a cold, but so far, it is staying just a snotty cold. No fever, just a little wet, productive cough. She’s on oxygen at night, and the last few days, I’ve kept her on during the day most of the time too given her cold. She was just hovering at the low end of her normal, and when she coughs, she dips, so it makes me feel better to give her a little more support through it. Clinic went okay on Monday. Labs, ECHO, EKG were all good. Couldn’t ask for anything better than that! I did get a good picture this morning though… this is how I found her when I went into her room to get her up for the day!!! Yep, happy, and SITTING UP! I'm glad you're starting to feel better, Krista.I hope a complete recovery is right around the corner. So glad you're feeling better, Krista! And Annabelle looks as cute as ever. Hope you're back to 100% soon! First … love the picture of Annabelle. She is definitely looks like a "morning person"! Next … I can totally relate to feeling the need to "get away". For a few years, whenever my husband would ask what I wanted for my birthday or Christmas, I would reply, "24 hours to myself". This eventually grew into "48 hours to myself" but I never received it! This spring, I finally took a couple of days to myself. I booked a room at the lodge of one of our state parks and had a wonderful, blissful 48 hours to myself (even though it was a gift I gave myself). My parents watched my boys and I honestly didn't feel one ounce of guilt! I believe that is because it had been something I needed for about the last five years. I said all that to say, that Lord willing, one day you'll be able to schedule that time for yourself, too, once life has become a little more routine for you. We'll continue to pray for a quick recovery and good health for the whole family. Valerie's Mom here…Glad to see that you post your frustrations. It's the nature of Moms to think they must do EVERYTHING PERFECTLY for their familes. Thanks for being the inspiration for me also. The scripture passages speak to me as a mom (even though it's been a LONG time since I've had to deal with the frustrations of juggling anything to do with kids. I'm praying for you and your family! Love the picture and glad you got some R and R in. Can't lead the troops unless the General is healthy. I had a quitting moment earlier this week myself, and that's pretty rare. I have a chronic illness that's been beating me up lately and a lot of stress on top of that. On Monday, I was trying to get ready to go to a friend's house and I was just so sick and tired of being sick and tired and I had a major meldown in the middle of doing my hair. Unfortunately, I didn't quit then. The next morning, I had another meltdown before work. So I decided that I was going to take a mini vacation that evening. I had a tv dinner, got donuts and watched a movie with my siblings. I can't tell you how much better I felt after doing that! Sometimes you just have to have a break from the stresses of life, whether you're a wife and mom or a single waitress! I'm so happy you're feeling better and that the doctor helped out with the antibiotics. 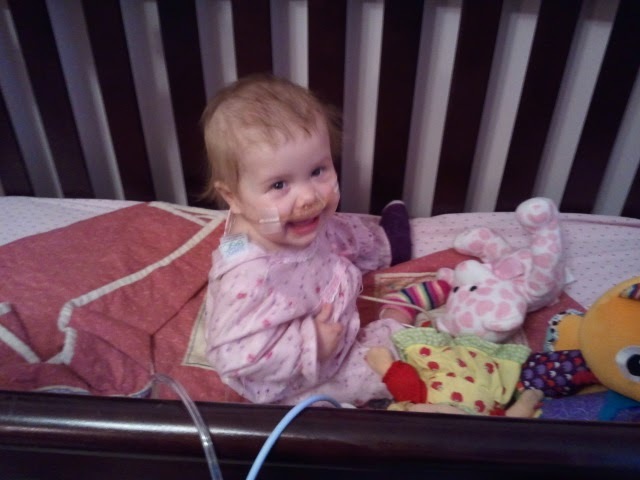 Annabelle looks adorable sitting up in her crib. And she looks happy and strong. This is awesome. I love your blog because you're real about life. You don't sugarcoat the truth which is a true blessing to ALL moms. You're right. Sometimes we just reach a breaking point and we have to leave. We do need to recharge and soak in a bit of the world so we can be the kind of wives and moms we want to be to our families. I had a similar cereal episode with my daughter YEARS ago. I got up, called my neighbor, told her to come over because I had to get out. I was so frustrated and angry and upset. She came. Bless her. And she didn't judge. That's all it takes. One good, honest and real friend to see you through the difficult days and moments. Then you can enjoy your family again and celebrate them. Always praying for you and yours.